An alarm clock, which not only wake you up, but at the same time can show news, reminders, horoscope, etc. 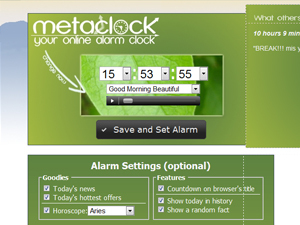 MetaClock is a browser based alarm clock, which not only wake you up, but at the same time can show today's news, hottest offers, horoscope, historical facts (date-related), notes and reminders, open favorite websites (maybe YouTube video). The wake-up time is easy to set and you can select from a number of audio sounds such as Good Morning, Morning Twitter, I Feel Good, etc. It has themes and translated to several languages. Produce house and room plans, try interior design and decorating ideas, and add landscape design.